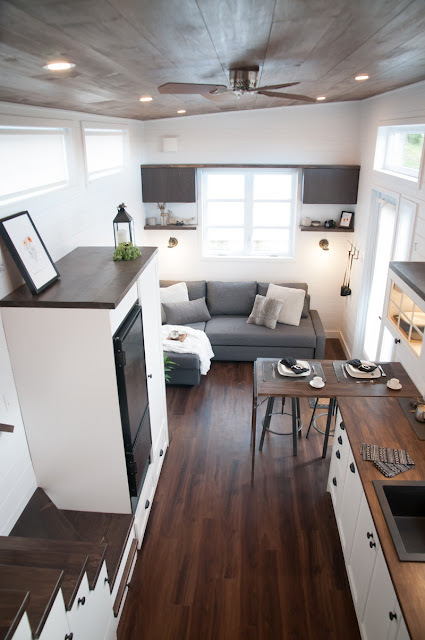 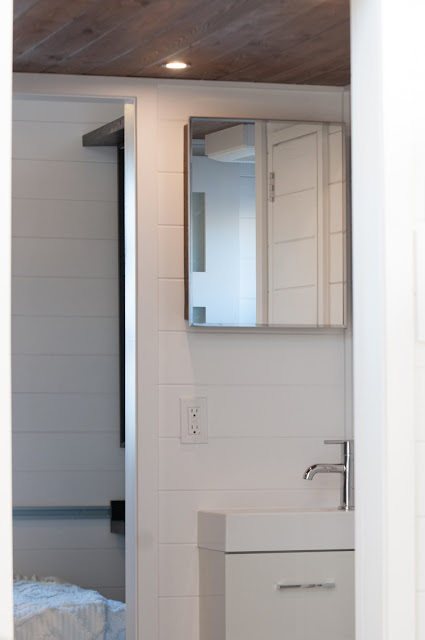 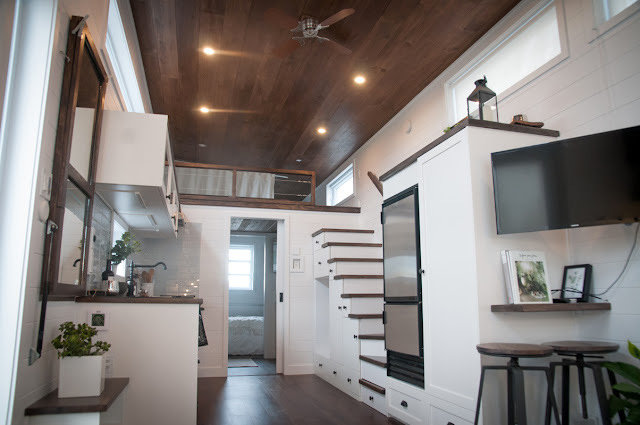 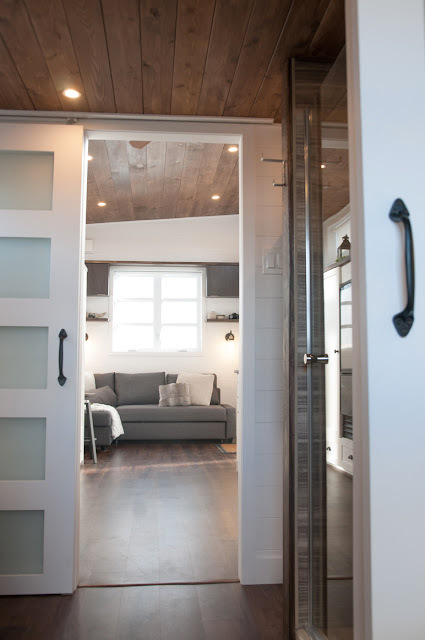 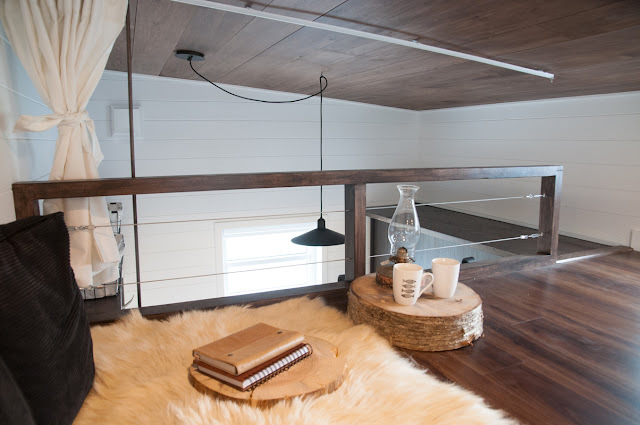 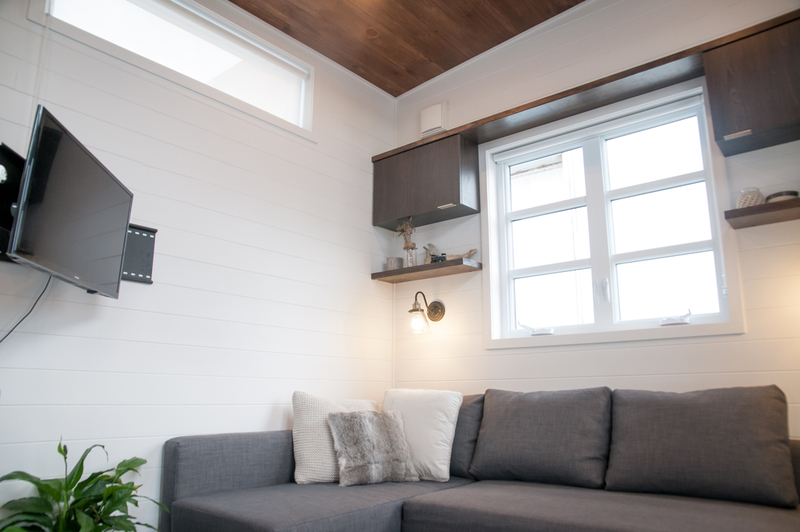 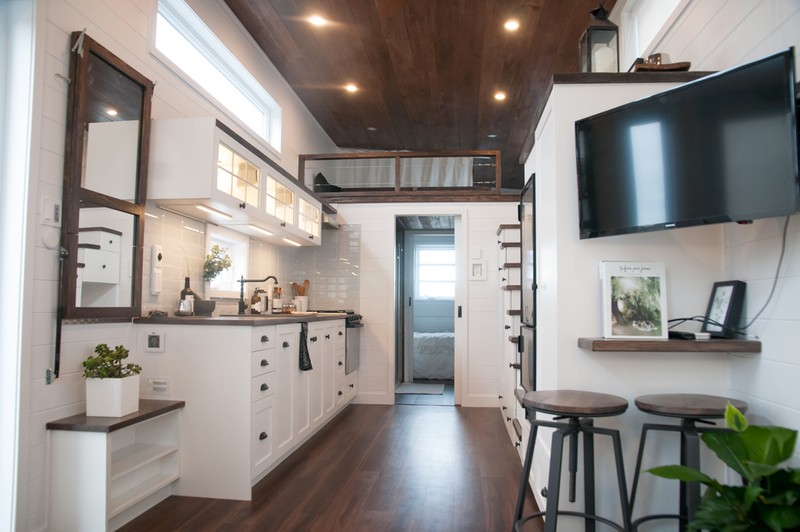 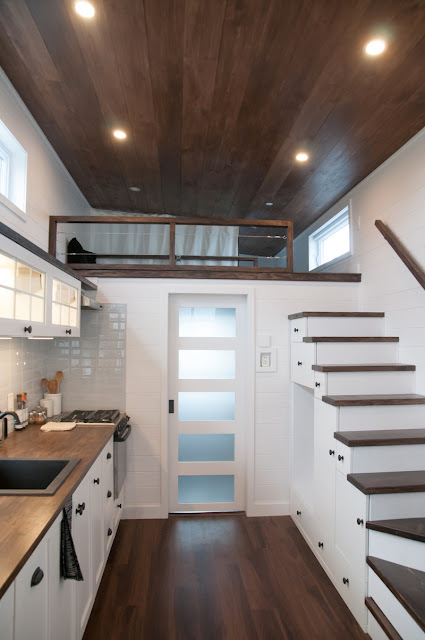 From Minimaliste, a tiny house builder from Quebec City, Canada, is this brand new and beautiful luxury tiny home! 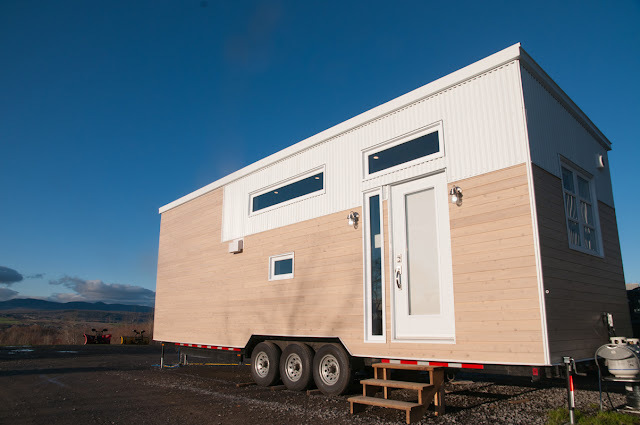 Named the "Laurier", the home is rather spacious at 10' x 32'. 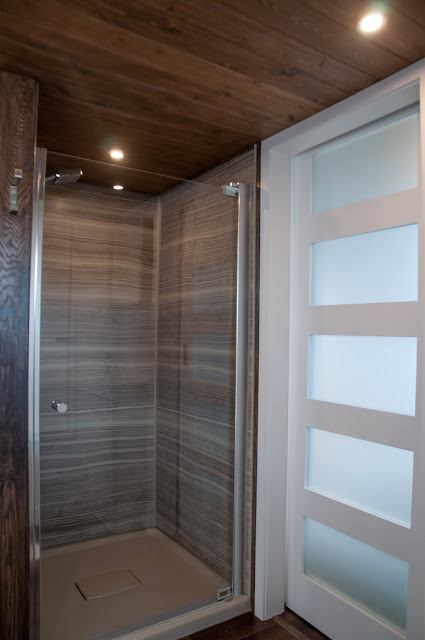 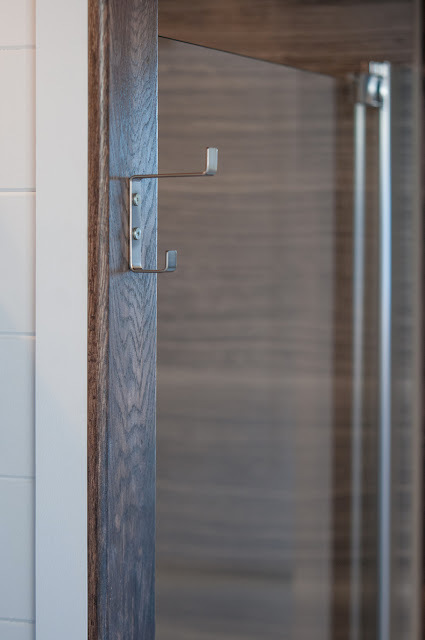 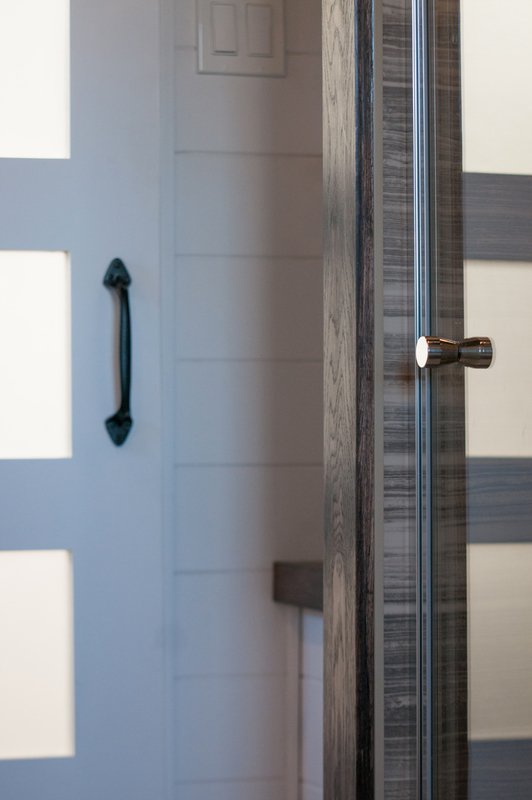 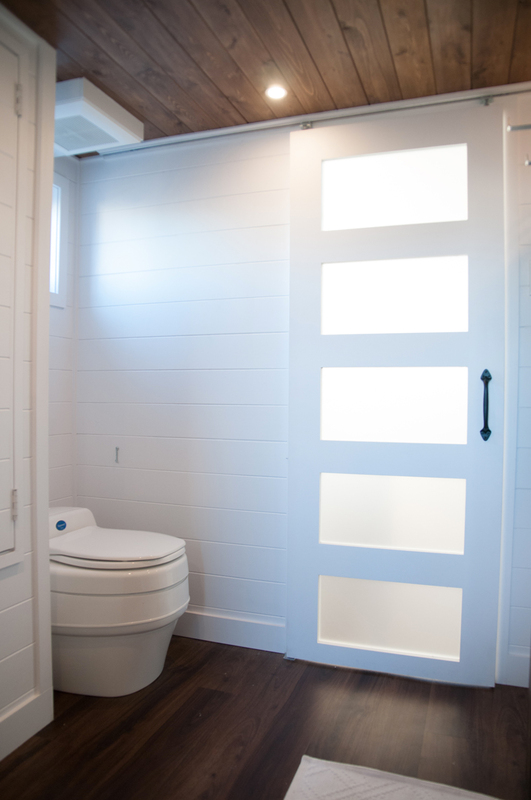 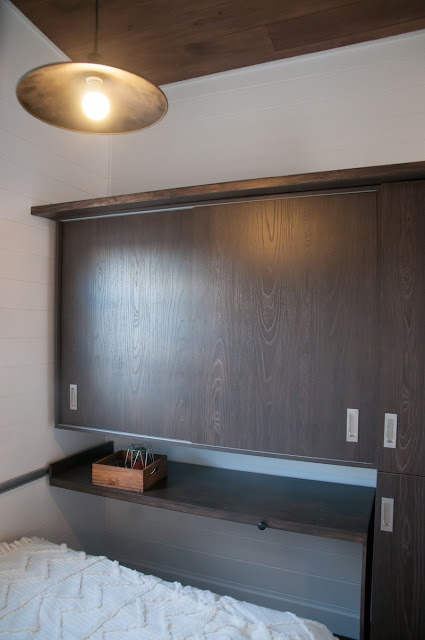 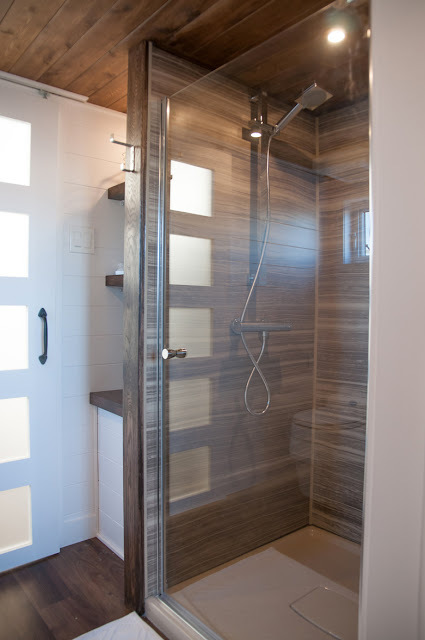 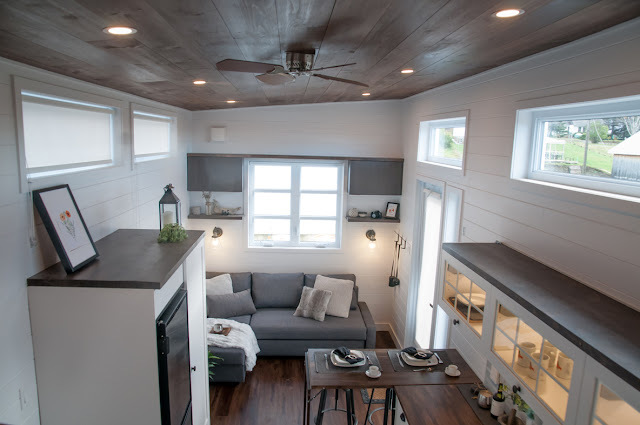 According to the company's blog, it was designed and built for a client with physical limitations, so extra care and thought had to be put into the home's design to make it comfortable enough for her! 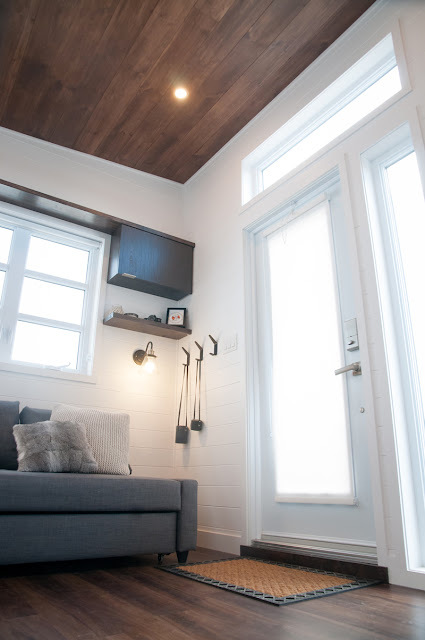 The exterior of the Laurier features beautiful white cedar with a natural colour and white roofing, moldings, windows, and accents. 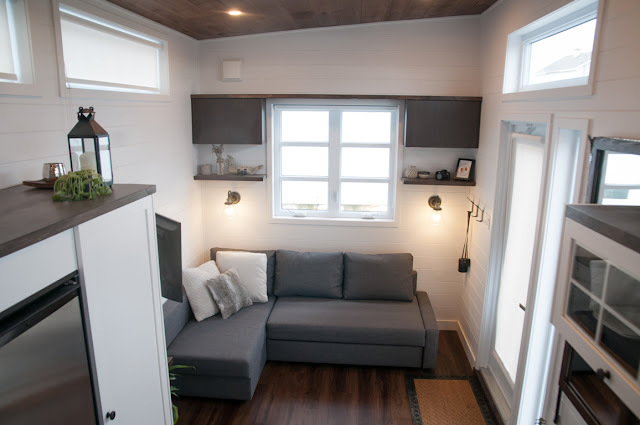 The home is also solar powered and comes equipped with a 2KW solar energy system to power the home! Inside the home is a bright, airy interior with a propane-powered hydronic radiant floor system. 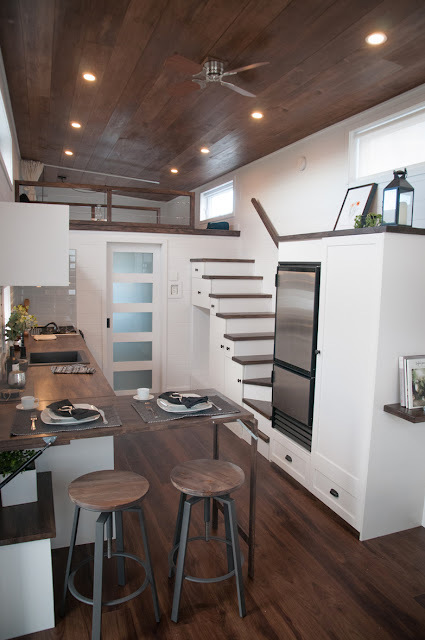 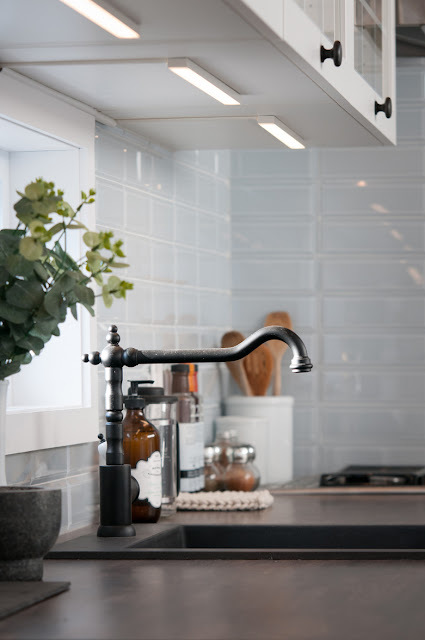 The home's kitchen features plenty of unique, luxe touches and a layout similar to Minimaliste's Chene model. It includes stainless steel appliances, solid wood countertops, illuminated cabinets, glass ceramics, and a retractable mirrored table. 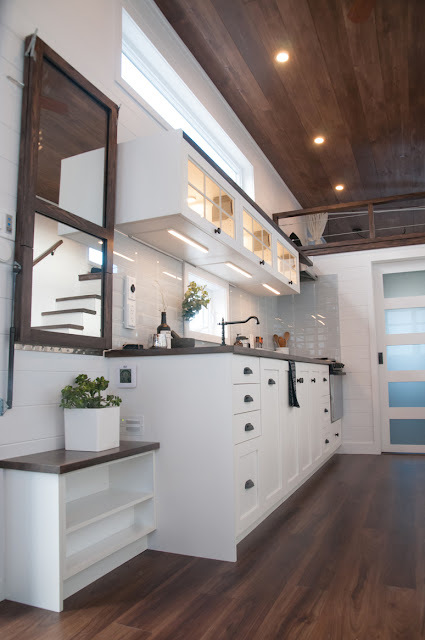 There's also a storage staircase immediately behind the kitchen with storage. 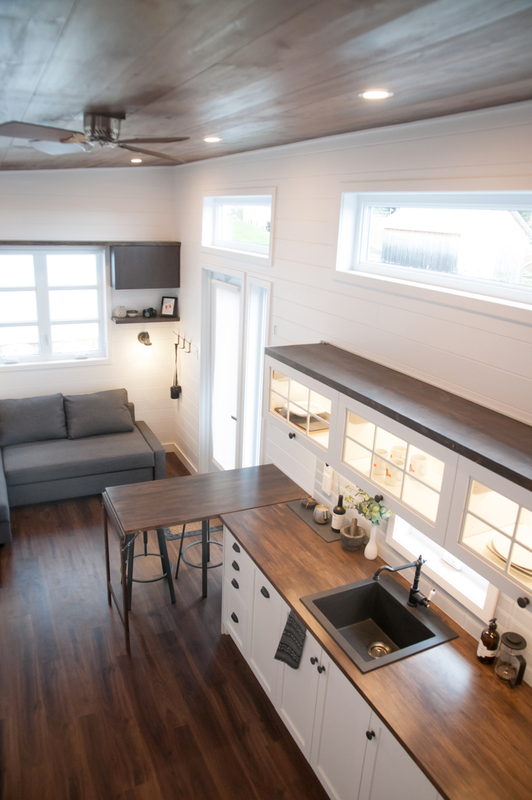 The Laurier's living room is situated right in front of the kitchen and comes with a 32" TV on a 180 degree swivel mount so you can watch TV while doing the dishes! 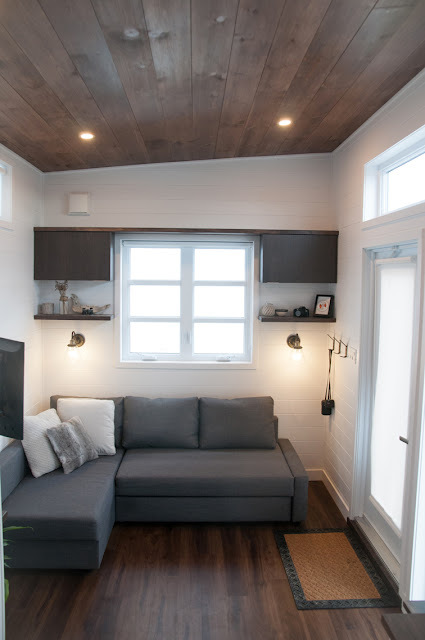 It also features an IKEA storage sofa with enough room for hosting guests. 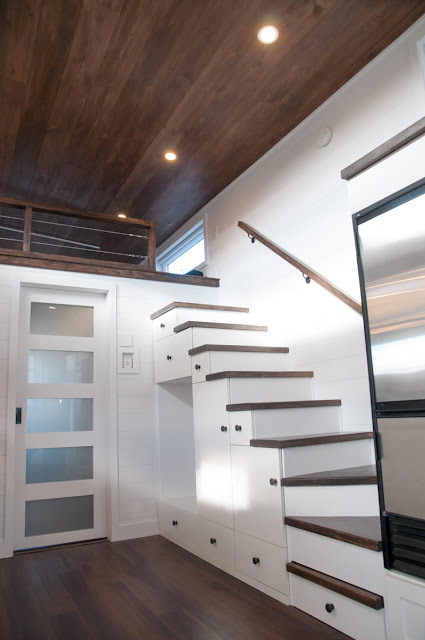 The master bedroom was designed to accommodate the home's owner in case she needed to spend extended amounts of time in bed. Minimaliste designed a desk that can be pulled out and over the bed, allowing someone to work and dine right from the comfort of their bed. 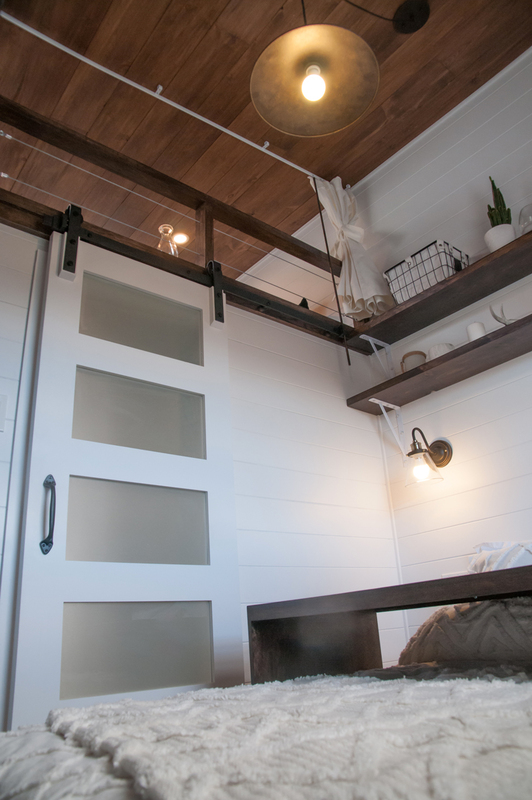 The room also included a USB outlet to charge a phone, a large cabinet with a sliding door, and two shelves over the bed. 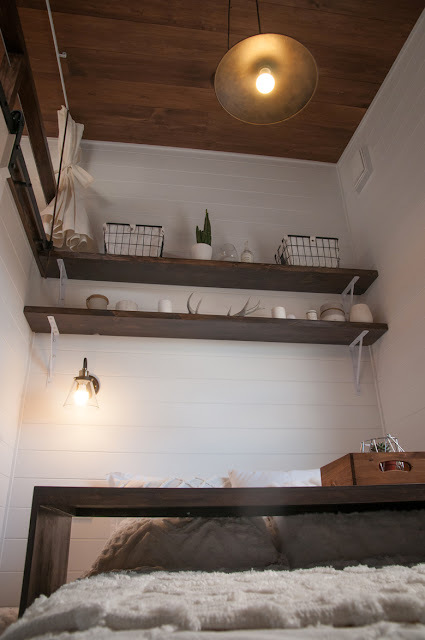 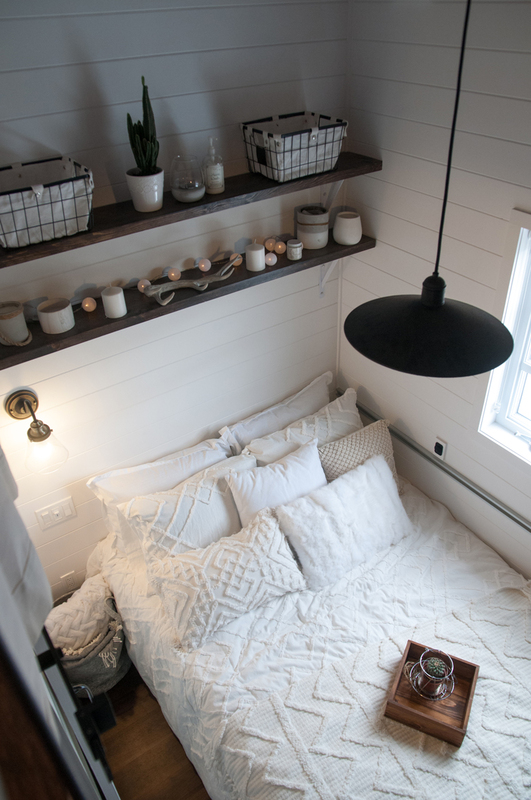 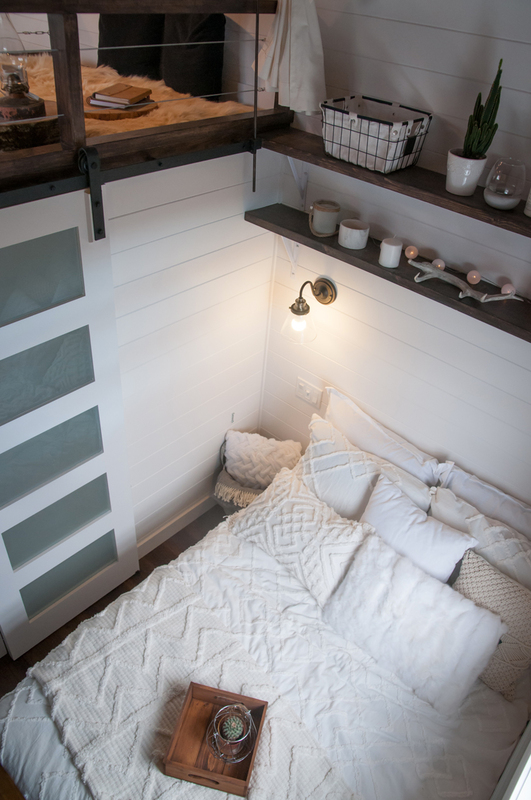 In addition to the master bedroom, there's a loft space that's ideal as a guest room and/or for storage! If you'd like to learn more about this tiny house and/or the builder, feel free to reach out to Minimaliste here! If you're interested in working with them to build a home of your own, custom builds range from $75,000 to $160,000 CAD (roughly between $59,000 and $125,000 USD).